In this blog post on the performance aspects of CDS views, I want to discuss how good performance can be ensured when building and accessing CDS views. Basically, it’s all about simple SQL performance rules that sometimes sink into oblivion when working with CDS views and HANA, but that are still valid – or only need a gentle new interpretation. As we have seen in the previous blog posts, the hierarchy of CDS views and tables we build to reflect our data model turns into pure SQL when the CDS view is accessed from ABAP or HANA studio. Our intent – that is, which data we want to read – is declared in a single SQL string that gets processed by the SQL optimizer to create an execution plan. So, before you start any work on CDS views, you should brush up your SQL know-how. This is especially important for us longtime ABAP developers, who previously often did not dare to implement ABAP Open SQL statements joining more than 3 tables. If you now embark on creating CDS views with dozens of underlying tables you should be aware of the complexity this can create, and you should have quite some SQL expertise to understand what it means to the database to process complex SQL statements. A good starting point is to remember classical SQL performance rules like ‘avoid SQL statements in loops’ or ‘completely specify all known filter fields in the WHERE-clause’. Some of these rules are reflected for example in SAP’s 5 Golden Rules for database programming (see part 2 of ABAP on HANA – from analysis to optimization). From these rules I deduced what I think to be most relevant for implementing CDS views and SQL statements accessing these CDS views. The less tables and views the database must join to process a request, the faster the statement preparation and plan creation, and often also the execution of the statement will be. The maintenance of a CDS view will be easier, and as we have seen in the previous blog post, also the created plans will be more stable for simple CDS views. 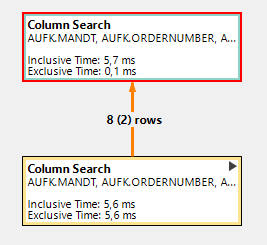 To a smaller extend, also the number of columns HANA needs to retrieve from the accessed tables in its column store, effects the runtime. If possible, define outer joins as LEFT OUTER MANY TO ONE joins and associations with “TO ONE” cardinality ([n..1]). 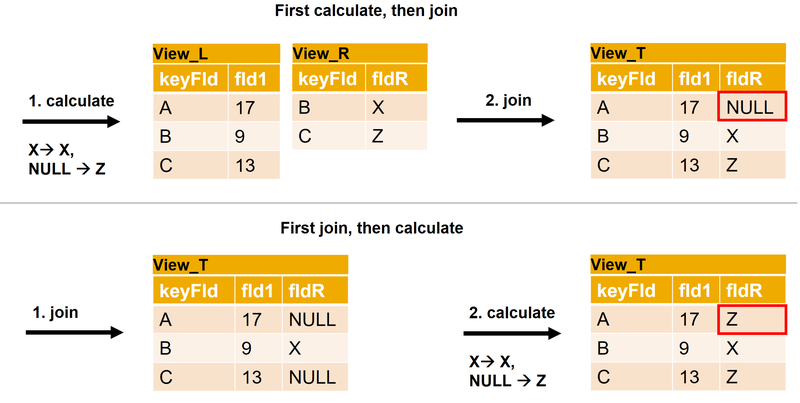 In this case, if no field is requested from the joined table, the database can avoid executing the join at runtime. Note that a wrongly stated “TO ONE” cardinality can lead to functional errors, if true the cardinality would be “TO MANY”. In the SQL statement accessing the CDS view, only request those fields required for your application. A SELECT * statement requires that many columns are accessed, which creates some costs for the HANA column store. You should prefer to use a well-defined field list instead. But please note, that several accesses to the same table / view with varying field lists are not worth-while. It is more effective to have only one database access requiring all fields needed for processing the application. Also using lengthy GROUP BY clauses make it necessary to access many columns. Generally, try to avoid GROUP BY clauses in CDS views that are re-used in a CDS view hierarchy. Data modelling tips will follow in next blog post. For the moment note, that any CDS view should be well-suited to the business requirements it has to fulfill and should not contain superfluous tables. Reuse of CDS views must not be exaggerated in a way that for an application there is only one or a handful of one-size-fits-all views that can do almost everything (that is, answer all possible queries). In the ABAP code snippet below there is an ABAP Open SQL join on CDS views I_BUSINESSUSER and I_PERSONWORKAGREEMENT, with 9 and 5 underlying tables, respectively. This join leads to a quite complex SQL statement. In fact, the author of the code just wanted to do an existence check for some USERID, which could be accomplished much simpler by joining two tables only. The author should talk to the owner(s) of the CDS views and ask whether they can provide a better-suited, slimmer CDS view. WHERE b~personworkagreement = @ls_approver-objid INTO @DATA(lv_userid) UP TO 1 ROWS. HANA is very fast in searching entries in its column store. Joining very large tables, on the other hand, also takes its time on HANA. If you are joining several millions of entries from a header table with 10’s or 100’s of millions of entries in the associated line item table, and you are not applying any effective filter, don’t be surprised that response times will be in the many seconds range. Such a response time can be OK for a statement that is only rarely executed, maybe once or twice a day by a small group of users. The situation is totally different, if you expect a statement to be executed very frequently, by many users. Then, to keep system load low and user satisfaction high, you need to achieve response times in the (sub-)seconds range. If your statement is reading data from tables with very many (millions of) entries, effective filters to reduce the amount of to-be-processed data are a must. To allow the filters to do their job, not only the WHERE-clauses should be given completely and contain selective fields, also in the join conditions all fields that define the table relationship should be specified. Otherwise it may happen that an existing filter field cannot be pushed to a joined branch of the SQL statement. Different from what you might expect, the LIMIT option (UP TO n ROWS or SELECT SINGLE in ABAP Open SQL) is no replacement for a good filter. The LIMIT is most often applied very late in the SQL processing, after all the expensive operations like joins and calculations have been executed on the full data set. The reason is that a lot of operations (ORDER BY, DISTINCT, aggregations, cardinality changing joins) prohibit an early application of a limit. Specifying good filters is mandatory to achieve good performance on large data sets, but it is not enough. You should also check whether your filters really reach the underlying tables. 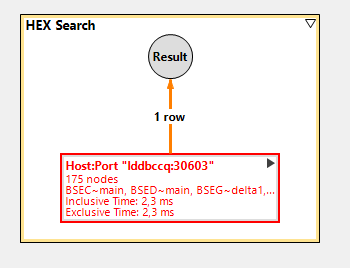 To this end, executing performance tests with reasonable (that is, production-like) test data and analyzing SQL traces and HANA execution plans with the HANA PlanViz tool are a must. In the plan, we need to keep an eye on intermediate results. Intermediate results are the ‘output’ of the plan operators, for example of filters, joins, or aggregations. The strategy of the SQL optimizer is to reduce intermediate results in plan execution as early as possible, and as effective as possible. Or: the faster the size of result sets can be reduced, the less will be the effort for subsequent processing steps. You already know the best way to support the SQL optimizer with this task: provide effective filters that can be pushed down towards the data source. The join between SFLIGHT and SCARR would have an intermediate result of 28.896 rows (left side). When the filter is pushed down to table SCARR (‘Predicate Pushdown’, right side), the intermediate result of the join is only 11.928 rows. So, by applying the filter early in the plan processing, the size of intermediate results could be reduced drastically. While the intermediate results of some operators (e.g. filters, some sort of joins) can be administrated quite efficiently inside the column engine, other operators need to ‘see’ the whole intermediate result to proceed with their work. This leads to ‘materialized’ intermediate results, which means that in-memory copies of the result must be created as temporary internal tables on HANA. If the materialized results are large, they have a significant impact on the performance of SQL statement execution. 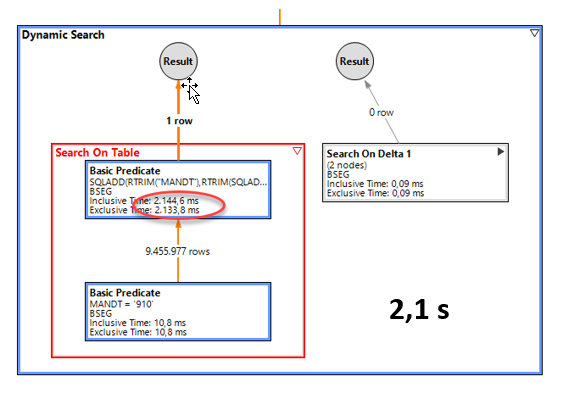 In the HANA PlanViz tool, large intermediate results can be identified by high numbers shown besides the connection lines of two operator boxes. In the screen shot from PlanViz below, intermediate results have been materialized due to a calculated field used in a join condition. 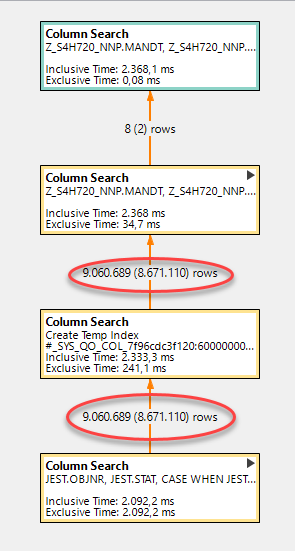 More than 9 million entries must be copied, leading to a runtime of more than 2 seconds for a simple SQL statement. As a rule of thumb, if millions of entries are passed between operators, runtimes in the many-seconds range must be expected. Besides that, big materialized intermediate results can also lead to out-of-memory situations on HANA. In future, HANA will significantly reduce engine switches with enhanced state-of-the-art query processing features. One of the main reasons for materialization are calculated fields. These – with the special case of ‘not NULL-preserving’ fields – will be discussed now. If our example view would be frequently accessed using only the calculated field ChangeDocumentTableKey as filter, it could be a good idea to persist this field in the view instead of calculating it for all rows in every access. Alternatively, an additional materialized (here: persisted) view for mapping the calculated field to a new, proper CDS key of the main view could be created. Both solutions are a trade-off between additional memory consumption due to the additional field or view against improved execution runtime for the access. Fields that result from string operations like CONCAT, RTRIM or SUBSTRING, from functions like COALESCE, or from numeric calculations are called calculated fields. Also, fields that are defined within a CASE … WHEN … ELSE construct are calculated fields. A CDS view ‘View_R’ contains a ‘not NULL-preserving’ calculated field ‘fldR’. A calculation is not NULL-preserving, if the calculation result cannot be NULL even if the input value is NULL. When field ‘fldR’ is not NULL-preserving, the SQL optimizer cannot swap the execution order of LEFT OUTER JOIN and calculation. Therefore, it is necessary to build up a materialization of View_R, and fldR is calculated for every row in View_R, even for those that are discarded after the join. Let’s look at an example for the impact of a not NULL-preserving field. I created a simple CDS view “cds_1” that joins table AUFK (order master data) with another CDS view “cds_2” with a LEFT OUTER JOIN. 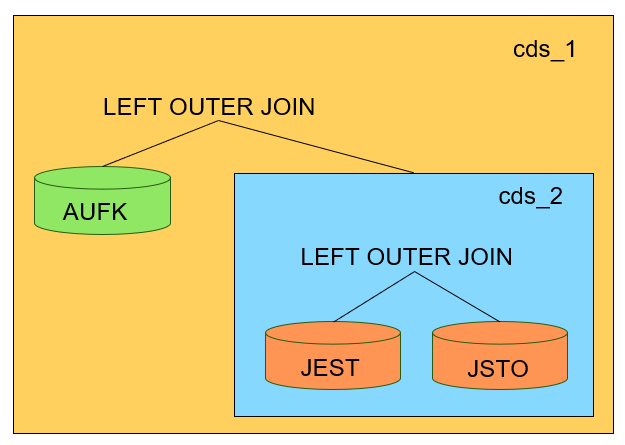 In view “cds_2”, there is a LEFT OUTER JOIN between the tables JEST (object status) and JSTO (status object information). LEFT OUTER JOIN "JSTO" "JSTO"
ON ( "JEST". "MANDT" = "JSTO". "MANDT"
WHERE ( "JEST". "MANDT" = SESSION_CONTEXT( 'CDS_CLIENT' ) ) ) "STATUS"
ON ( "AUFK". "MANDT" = "STATUS". 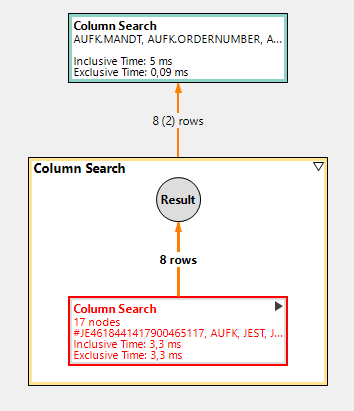 "MANDT"
In the plan, we recognize both a high number of rows that are copied between the operator boxes (nearly 13 million) and the ‘stacked column search’ operators. The latter are a sign that not all filters could be pushed down. The database had to materialize all rows of table JEST to fill the field ISUSERSTATUS before the filter could be applied. In a customer system with much more entries in table JEST, the runtime of this statement could easily achieve one minute. LEFT OUTER JOIN "JSTO" "JSTO" ON ( "JEST". "MANDT" = "JSTO". "MANDT"
WHERE ( "JEST". "MANDT" = SESSION_CONTEXT( 'CDS_CLIENT' ) ) ) "STATUS" ON ( "AUFK". "MANDT" = "STATUS". "MANDT"
The runtime for this statement is down to 5 ms. The filter can be applied early and the calculation needs to be executed only on the small filtered result set (8 entries). Another way to improve the SQL statement / CDS view would be to eliminate the ELSE-branch entirely. This is possible, if the consumer of the statement can live with NULL values in the result set. The runtime of this statement is also around 5 ms. Calculations should best be done in the consumption view (highest level view), after all filters and data reducing joins have already happened. This might require a complex re-work of the whole view hierarchy. Interface views shall not define calculated fields. To avoid calculations and enable filter push-down, introducing redundancy and / or persisting a calculated field in the table is a valid option. This is the 5th of the Golden Rules for database programming and it seems to be the most outdated in times of HANA and mottoes like ‘move data-intensive calculations to the database’. But still, striving for minimal resource consumption is key also for the database. Unnecessary database accesses and calculations must be avoided, and as one example, the good old buffering of tables or CDS views on the ABAP application server is still possible and recommended. Furthermore, new caches have been introduced on the HANA server for aggregated data. Imagine when in the morning hundreds of users log in to a system to display some Fiori Overview Page. It does not make sense to calculate identical key figures on these pages again and again for every user. Instead, the data could as well be read from HANA’s static result cache. Beside this, a dynamic result cache is developed, and both application specific caches and aggregate tables still have their justification. However, I must mention that all these (endless) restrictions take the sting out of CDS. What a great blog series Randolf… Thankyou.